Something has survived…It’s a compy! 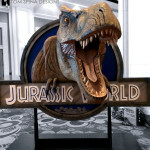 A custom display for screen used Jurassic Park, The Lost World compy movie prop. 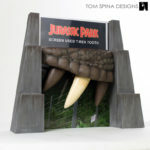 We created a custom carved foam display for original movie props like this The Lost World compy dinosaur from the Jurassic Park sequel. Known as “Compies” in the film, the dinosaur here is a Compsognathus. 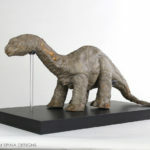 The rubber dinosaur prop featured a bendable wire frame which allowed film makers to move and manipulate the puppet. 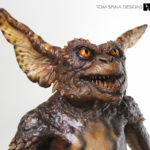 On arrival to our studio, the compy prop needed some minor repair, due to a few small cracks and tears where the wire was showing through the rubber material. 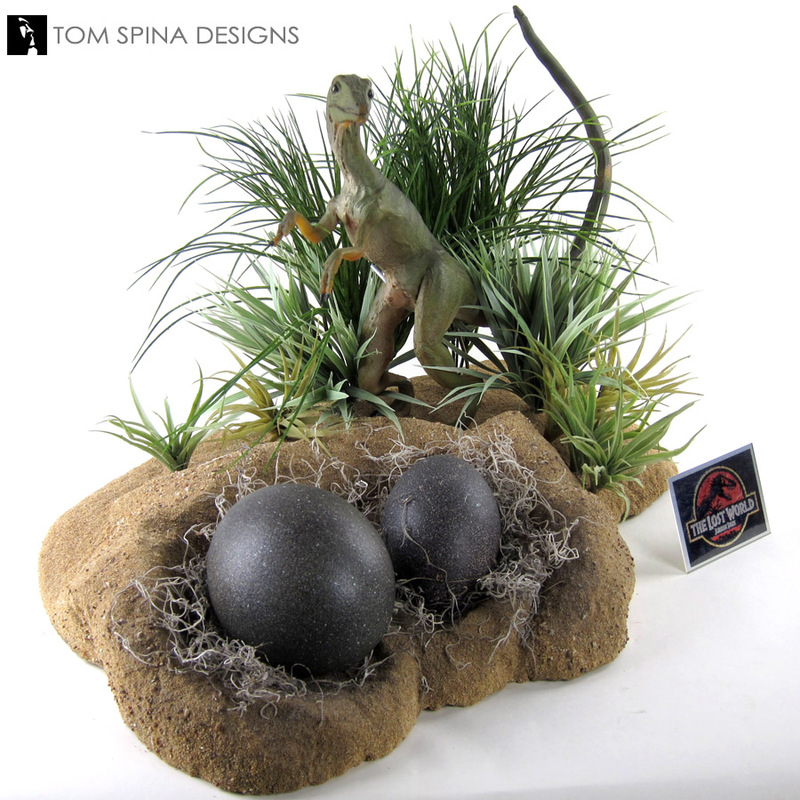 Our client also had a screen used egg (the smaller one) and a replica ostrich egg (the larger one) which he water to add to the display. 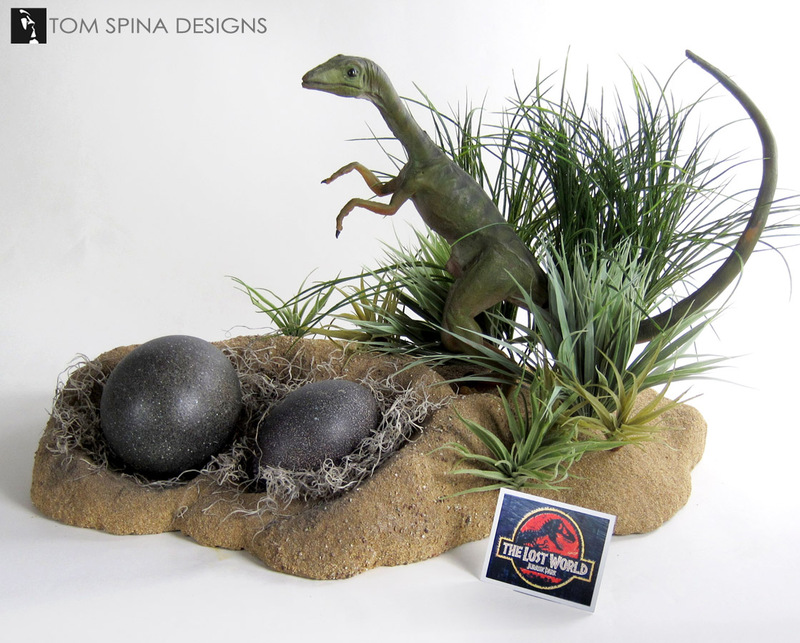 We painted the ostrich egg to match the screen used egg and created a themed display for our little dinosaur. 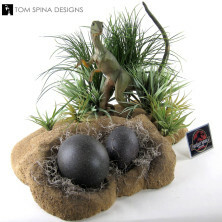 In order to display the two eggs with the compy dinosaur in a cohesive way, we came up with a nest for the eggs hidden in the sand and grass. The same grass would also help hide the stand for the compy prop. 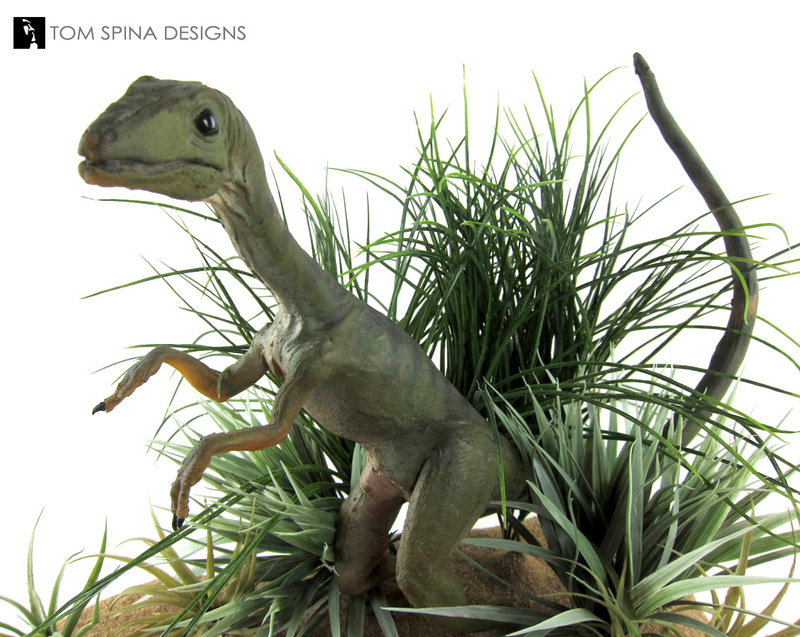 We wanted to give the impression that our little scavenging dinosaur puppet discovered the nest on the beach of Isla Sorna (the infamous “Site B” of the movie). 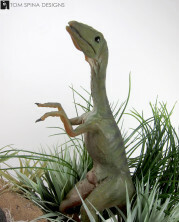 We carved the base out of EPS styrofoam using the natural texture of the material to do some of the work for us. We also added carefully shaped divets for the two eggs into the base to be sure that there was no chance of the rolling off of the display. We coated and painted the base to look like the sandy soil of Isla Sorna. 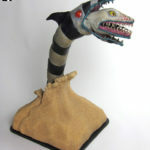 We then added the mossy nest grass and the faux grass, Being careful that none of the grass was applying any pressure to the delicate skin of of the compy puppet.